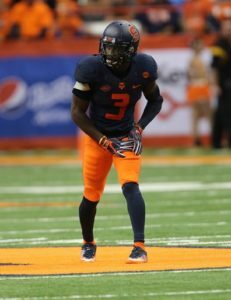 Syracuse University senior wide receiver Ervin Philips (West Haven, CT) has been selected the Walter Camp 2017 Connecticut Player of the Year. The award is presented to the top college football player who is a resident and/or played scholastically in the state of Connecticut. The award is voted on by the Walter Camp Football Foundation membership. Philips is the fifth Syracuse player to earn the honor, joining former Orange standouts Dwight Freeney (2001), Kyle McIntosh (1997), Rob Thomson (1990) and Terry Wooden (1989). A Second Team Atlantic Coast Conference honoree in 2017, Philips recorded 89 receptions for 904 yards and four touchdowns. His 89 receptions were second only to SU teammate Steve Ishmael, a Walter Camp Second Team All-America honoree, in the ACC. Philips also ranks sixth in the country in receptions per game (7.7) and 38th in receiving yards. Philips had two 100-yard receiving performances, including a career-best 188 on a school-record 17 receptions on Sept. 30 versus North Carolina State. Philips also posted four receptions for 94 yards and one touchdown in an upset victory over top-ranked Clemson on Oct. 13. In 2016, Philips recorded 90 receptions for 822 yards and six touchdowns and earned All-ACC Honorable Mention. For his collegiate career, Philips had 223 receptions, which ranks second in school history, for 2,069 yards, which is the seventh-best total. A native of West Haven, Philips played scholastically for head coach Ed McCarthy at West Haven High School. In his senior year, Philips led the Blue Devils to the Southern Connecticut Conference Division I East title and a berth to the Class LL state semifinals. A consensus All-State honoree, Philips was named the SCC Division I Player of the Year and also earned Walter Camp All-Connecticut honors. Philips set school career records for rushing yards (4,596), touchdowns (88) and total offensive yards (6,182). Philips is the second former Walter Camp All-Connecticut Team scholastic honoree to go on to earn Connecticut Player of the Year collegiate honors, joining former St. Joseph HS and Temple University linebacker (and current Pittsburgh Steeler) Tyler Matakevich. Philips, along with the members of the 2017 Walter Camp All-America team and Player of the Year Baker Mayfield (Oklahoma), Coach of the Year Mark Richt (Miami), along with other major award winners (Alumni Award-Eddie George; Man of the Year-Calvin Johnson; Distinguished American-Lee Corso), will be honored at the organization’s national awards banquet, presented by David McDermott Lexus of New Haven, on Saturday, January 13, 2018 at the Yale University’s Lanman Center. Walter Camp, “The Father of American football,” first selected an All-America team in 1889. Camp – a former Yale University athlete and football coach – is also credited with developing play from scrimmage, set plays, the numerical assessment of goals and tries and the restriction of play to eleven men per side. The Walter Camp Football Foundation – a New Haven-based all-volunteer group – was founded in 1967 to perpetuate the ideals of Camp and to continue the tradition of selecting annually an All-America team. Visit www.waltercamp.org for more information. Presented to the top college football player who is a resident and/or played scholastically in the state of Connecticut. The award is voted on by the Walter Camp Football Foundation membership. 1982 – Mike Marshall, DB, Southern Conn.